Notice and agenda filed in the office of the City Clerk and posted at City Hall at 3:00 p.m. on Friday, July 29, 2011. A. Approval of July # 3 Payroll in the amount of $42,397.29. B. Approval of Claims in the amount of $15,154.66. C. Approval of Minutes from July 18, 2011 Regular Meeting. D. Approval of FY 2008 CDBG Contract Extension. 7. Presentation from Retail Attractions, LLC. -- Rickey Hayes presented a "Market assessment" of Collinsville with data provided to retailers considering location here. The data provides demographic infornation in Collinsville's "trade area" which Hayes represented as mostly centered on the Highway 169 corridor from north of Owasso to near the Kansas State line and including more than 35,000 potential shoppers. That group of shoppers have an average age of 39.2 years and a $50,000 average income. Hayes also indicated several retailers were "looking at" potential locations near the new Collinsville Quik Trip at Highways 75 & 20 (including restraurants, grocery, hotel, among others as the retail outlook has inproved in the past few years. 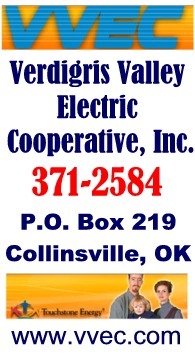 He also indicated some interest on the east side of Collinsville. 9. Discussion and possible action to appoint Cheryl Hunt to Park Board. -- Approved. Cheryl Hunt (Principal at Wilson Elementary) is filling the place on the board vacated by Rusty Poindexter. * "Doing Business With Cherokee Nation" topic of Chamber meet Thursday Aug 4th. * Pam & City Treasurer Lori Stephens attented a city treasurer's conference and learned a lot about investing public funds. * Pam requested the Sept 6th city meet be moved to Sept. 12. A. Approval of July # 3 Payroll in the amount of $28,096.49. B. Approval of Claims in the amount of $48,413.66. C. Approval of Minutes of the July 18, 2011 Regular Meeting. * Water conservation being monitored but OK so far. With 1.1 million gallon production capability daily ... this past Sunday used 84% of that. There is an additional 1.7 million galons in the tank and stand pipes. * Water conservation regulations will likely be proposed at next city commission meet to prepare for potential contingencies. First step would be voluntary water use reduction. Later steps would be mandatory and include even/odd watering restrictions and shutting down the spash pad as examples.